Besides the music there’s nothing more I love about going to concerts than discovering the entertaining, inspiring and creative behaviors of fans as we all get lost in the rush of the live music experience. And as the summer season wraps up this weekend, it’s obvious what made my summer festival experiences so much fun this year. Yes, when the music left me wanting more it was you, my fellow concert fan, that came to the rescue. It was you that carried me through Eminem’s disappointing showing at Lollapalooza. And when Cee-Lo fizzled out too, it was you who put a smile on my face and got me thinking about what I love about concerts, and the emotions we feel. When it was all said and done, it was the unexpected conversations, gatecrasher stories, concert fan tribe experiments and funny mud-dancing moments that made the losses worth it this summer. And it was even better when I got the chance to talk with fans after the show, and learn even more about the story behind your experiences. All this considered, it just goes to show that without the fans, live music is pretty much a meaningless and emotionally void experience. To put it simply – you rock! Thanks again to all the fans featured in this post. You’ve all shown why we have a great group of fans to add to our ongoing Best Concert Fans of the Year Experiment that we’ll wrap later this year. So without further ado, here’s our special collection of fan photos, memorable muddy moments and short stories chronicling our adventures and fan highlights at summer music festivals in 2011. 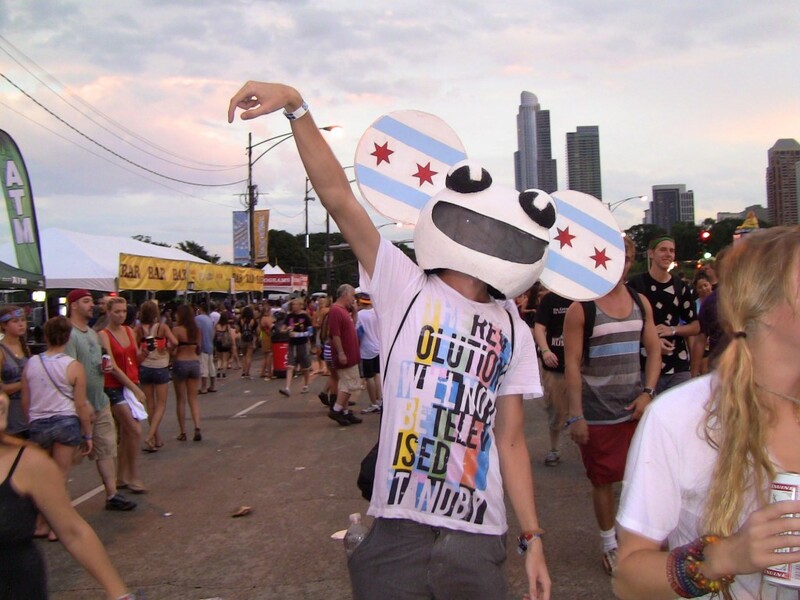 Good, bad, strange or funny, go ahead tell us what your favorite festival moments were. Post your thoughts, photos, and videos in the comments below and we’ll share them in a future episode of Live Fix Radio! 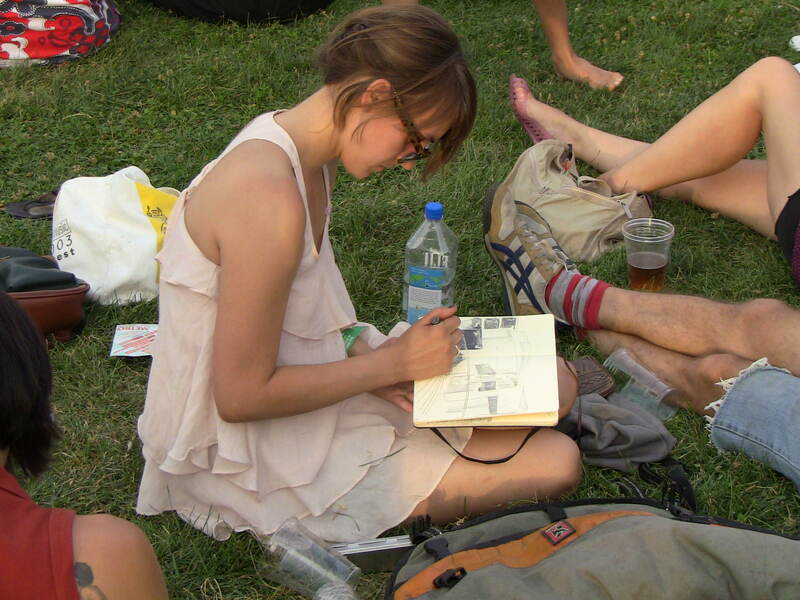 Serendipity at The Pitchfork Press Tent? While I was hanging out and re-charging my cell phone in the Press Tent at Pitchfork Festival, Andrea frantically came up to me and politely asked if she could borrow my cell-phone charger to charge her phone. And while she waited, she told me how she had unfortunately gotten separated from her friends for the last two hours and couldn’t re-connect with them because her cellphone had died. Andrea was pretty upset to find out that her friends had actually moved on without her to go find a spot front row for Animal Collective. Despite unfortunate separation situation, we ended up having a great serendipitous chat about her favorite concert experiences. 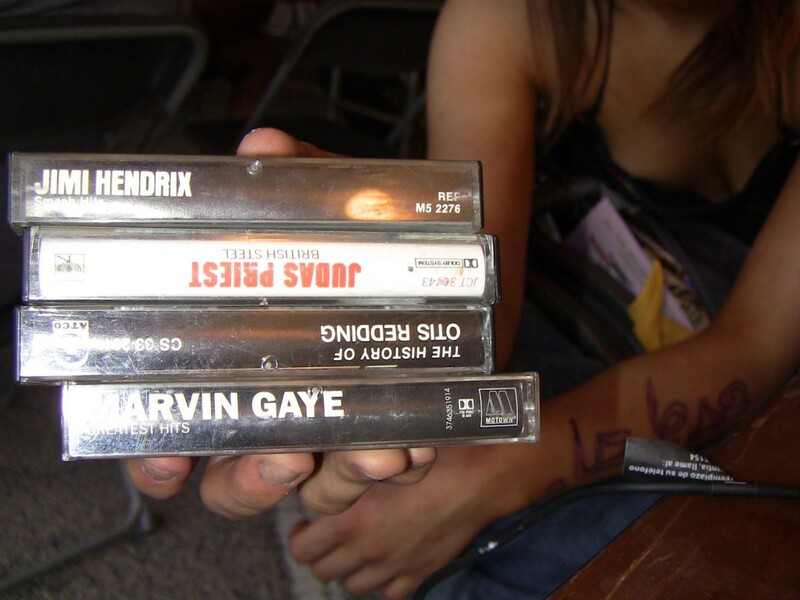 She also filled me in on the details behind the new cassette tapes she has just bought at the Pitchfork record store just a few minutes ago. And I wonder if everytime she listens to those tapes will she have good memories of Pitchfork, or we she only remember getting ditched by her friends? I haven’t had a chance to talk to Andrea since but I do hope she was able to re-connect with her friends and enjoy Animal Collective and the rest of the festival. What’s Your Special Concert Spot? 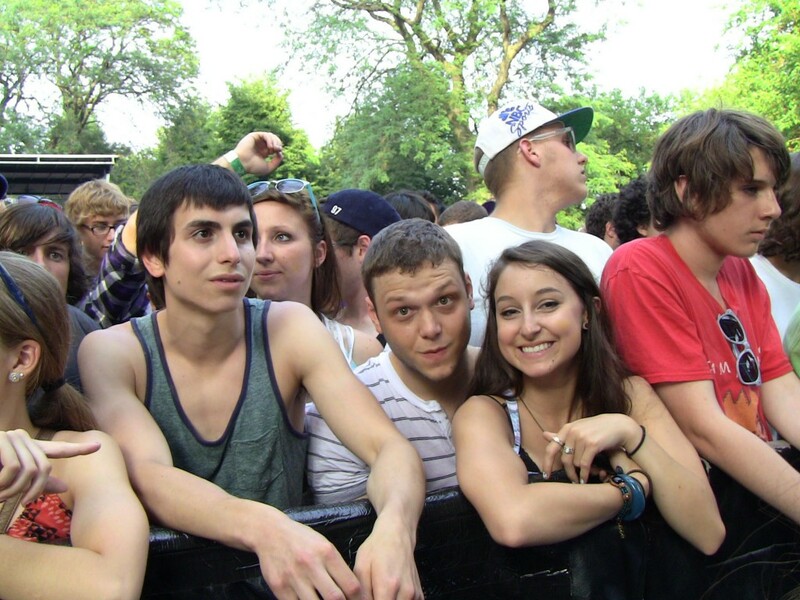 While waiting for Das Rasist to start I had the pleasure of briefly chatting with the couple below ( the girl smiling and the guy with the goofy smile) about their Pitchfork experiences. And I was amazed when they told me that this was their second time at Pitchfork. And this very spot, front and center at the Blue Stage, holds a special significance for them because it’s the same spot where they camped out last year to enjoy other Pitchfork bands. I asked them if they had planned on romantically carving their names into the metal stage barrier guard rail, and they had they hadn’t yet. But they did say that they would think about doing that at the end of the festival this year. These two photos capture the beauty of fans showing how live music can conjure deep emotions that make us want to get lovey-dovey and form an intimate human love pretzel. Or if the music moves us, we can even express ourselves with a crafty live concert sketch. What Concert Fan Tribe Do You Belong To? 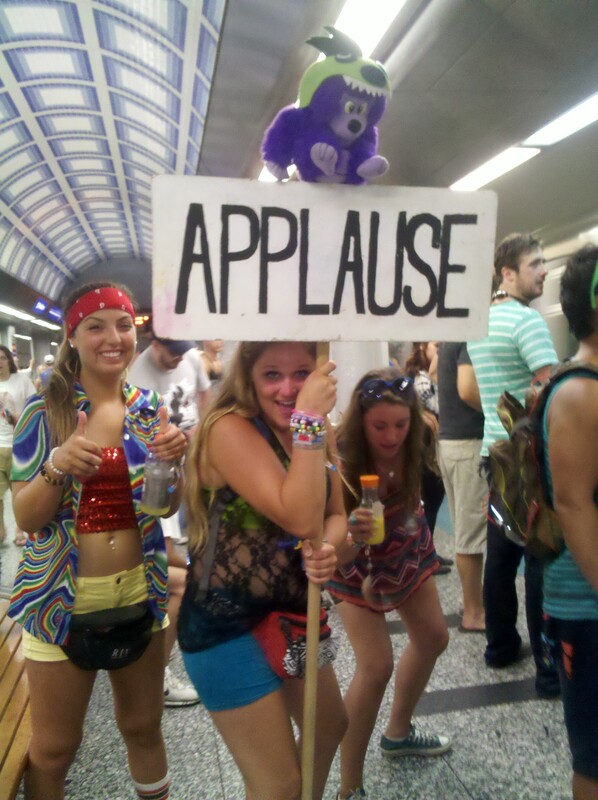 I had the pleasure of seeing these “Applause Sign” fans (above) on the way home from Day One of Lollapalooza. 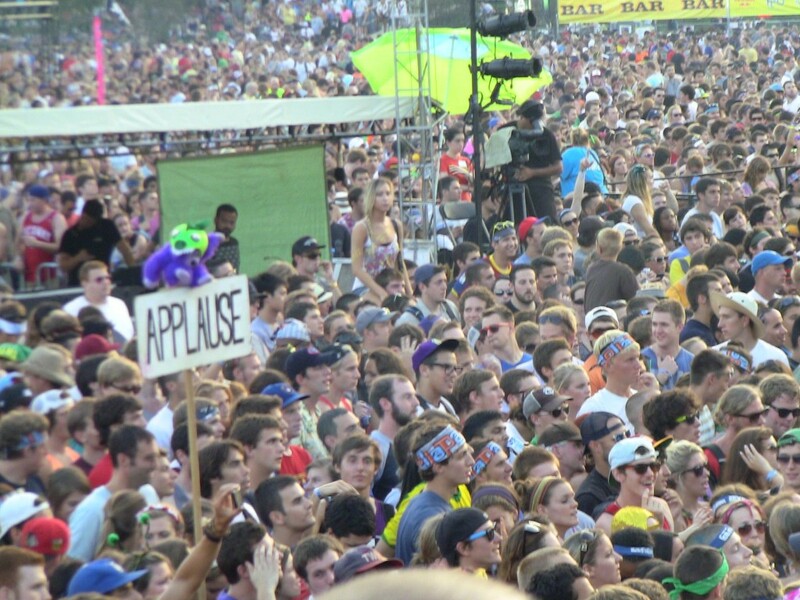 And then on Saturday I saw their Applause sign in full action during Atmosphere. Then on Sunday I stopped to grab a shot of Kyle, a fan who expressed his love for Deadmou5. These fans, like the thousands of others are great example of how micro fan-tribes spring up during festivals. And the beauty of it is that you never know what will inspire fans to make their strange and unique creations to represent and celebrate their individuality and personal expression. Concert fan tribes and the funny sticks to represent their tribes are two topics that have always fascinated me. And we’ll be taking a deeper look this creative anthropological phenomenon. So if you have done something like this before, drop a comment below. As we headed into the festival on Saturday, I stopped to talk with Steven who had flown from Oklahoma in hopes of scoring a Lolla ticket. But he wasn’t able to score a ticket, so he told me how he had embarked on a gate-crashing adventure with other eager and ticketless fans. 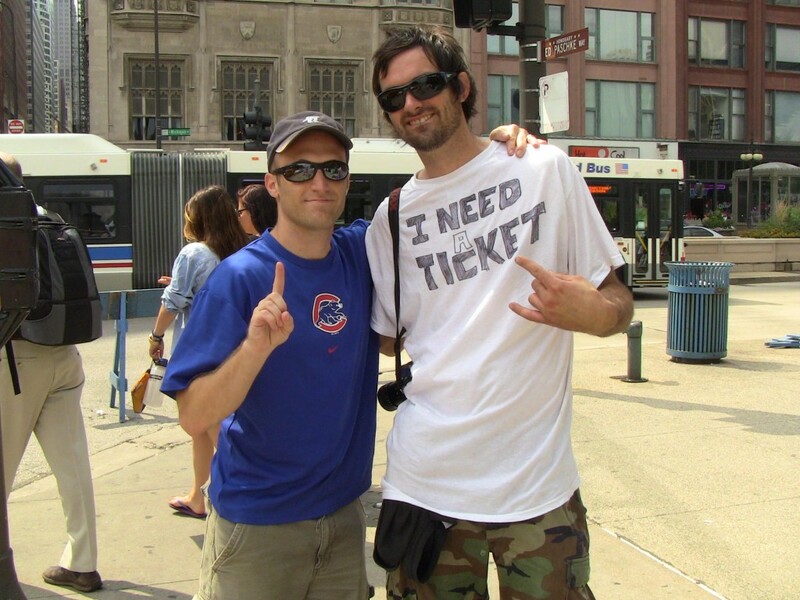 Steven’s story was part of record setting year of gate-crashing at Lollapalooza. And stay tuned as we follow-up with Steven to see how things turned out. Do You Snap-Judge The Use of Mobile Phones During Concerts? I saw this young fan entranced by his mobile phone and it made me think of our mobile experiment. I don’t think it took anything away from his experience because at this point mobile devices play such a crucial role in how we remember and experience concerts in real-time. Who are we to judge how others use their mobile phones to enjoy a show. With some many apps, like the Layar AR app, a fellow fan could be getting more out of a show that a fan who doesn’t use their mobile phone during a show. What do you think? This is what can happen when Crissy Murderbot and MC Zulu throw plastic lip whistles in to the crowd and then proceed to lead us all in a crazy hip-shaking and chest-rattling parade of of jungle, dubstep and dancehall beats at 1:00 in the afternoon. It put a huge smile on all our faces, even when one of the whistles hit me in the eye as Zulu tossed them from the stage. Were you in the crowd too? 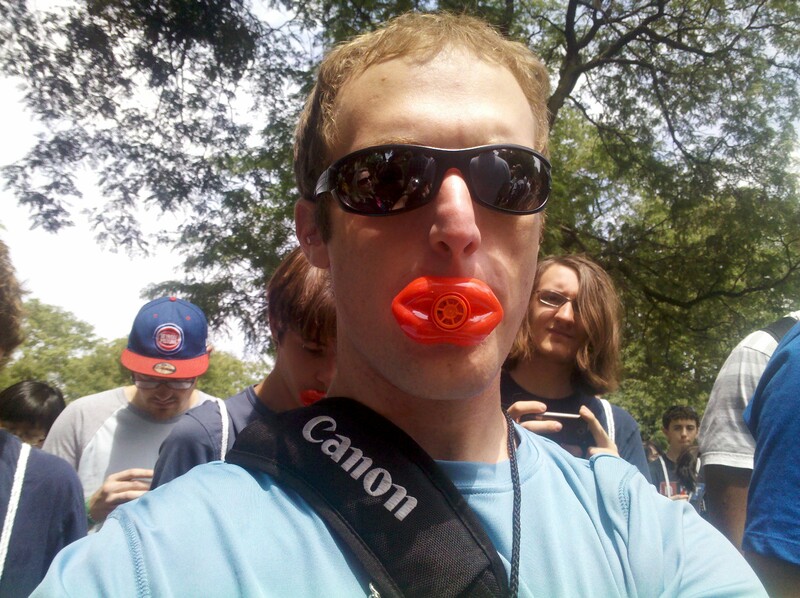 Do you still have your whistle? Yes, I still have the whistle and all I have to do bring me back to this glorious moment is put my lips together…and blow. Is Mud-Dancing Therapeutic For Concert Fans? 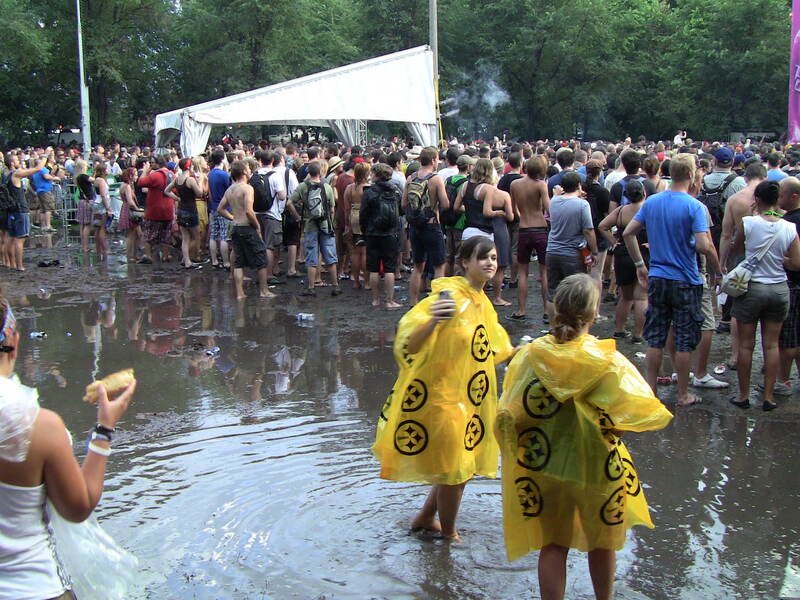 As I mentioned at the beginning, for me, half of the fun of Lollapalooza 2011 was defined by observing and celebrating how the fans responded to the torrential downpours as we all splashed, sloshed and slipped around in the Lolla’s chain of mini-mud lakes on Sunday. And seeing mud-dancing at music festivals never ceases to amaze me. It’s so fascinating to watch how we all interact with the mud and how it changes the concert experience for us. From Glastonbury to the classic Woodstock scenes, or even the Westland Michigan Mud Festival, there has to be some reason why thousands of fans want to get dirty. On the surface I could clearly see that fan were letting go of stress, anxiety and lots of tension. So there has to be some type of psychological benefits that draws us in to the mud-playing. That said, I’ve been reading research studies that talk about the mental health benefits of playing in the mud. And one report says that the soil bacteria in mud is actually good for children and helps increase serotonin levels in the brain, which reduces anxiety. 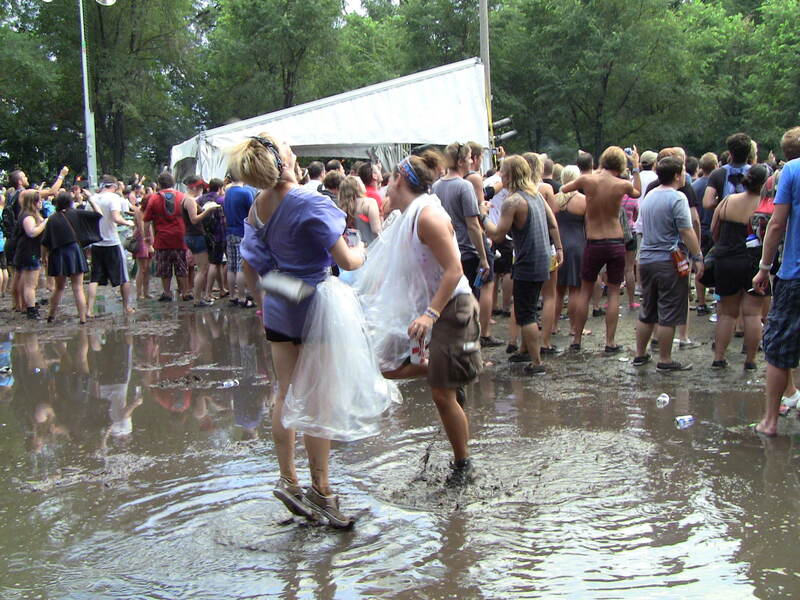 Was some of this beneficial mud-playing going on at Lollapalooza? Did you have a dancing-in-mud therapy session and not even know it? Where do you stand on the mud-people continuum? Do you dive in, or sit back and watch and wonder why? To wrap up this massive Concert Fan Thank You Letter Experiment, here’s an experimental video that I took showing what happened at the mud-hill behind the Perry Stage while Kid Cudi wrapped up his set on Sunday night. Note: Besides the dirty mud, the video also has some filthy language in it, so do proceed with caution. If you’re impatient, the real fun begins at the 1:30 minute mark.